A number of Russian cities have been treated to an awe-inspiring sight of so-called light pillars seemingly shooting up from the ground all the way up to the horizon and beyond. Vertical beams of bright light, reminiscent of columns, were captured by sleepless Russians over the past weeks, and the stunning images were quickly shared on social media. ‘Light pillars’ in the central city of Rostov stirred controversy with some people coming up with mystical explanations for the occurrence. Experts were quick enough to dispel those myths though, saying it’s nothing but an atmospheric optical illusion. “Friday afternoon saw a rise in temperature and then there was a sharp fall down to minus 14 degrees Celsius at night. The air was humid and then the water started to crystalize. Basically, pieces of ice or snowflakes started to form in the air,” Oleg Stepanyan, a member of the Russian Academy of Science said, according to RIA Novosti. The phenomenon occurs when natural or artificial light is reflected from ice crystals floating close to the ground. Which is exactly what happened earlier this week in the city of Togliatti. Russia’s federal subject of Tatarstan also had its fair share of light beauty. This photography enthusiast from northern Murmansk said the natural visual effect may be called “a variation of halo,” which usually takes place during daylight. Another image comes from the south-eastern city of Saratov. 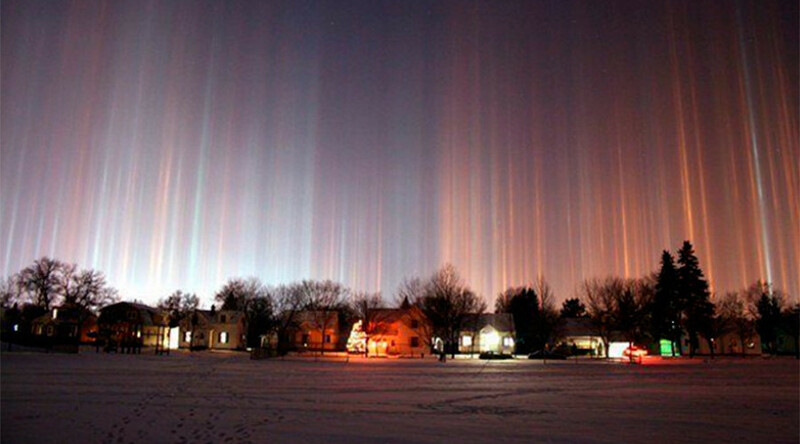 Colorful shining pillars were even spotted in Moscow, a region where the views of sky phenomena are usually obscured by clouds and bright lights. Ukraine and Belarus reportedly also had the opportunity to appreciate the mesmerizing game of ice and light.